History is Curly’s favorite subject so we were thrilled to review the Veritas Press Self-Paced History course! We studied the Veritas Press Self-Paced History: Explorer’s to 1815. We were able to enjoy the online course and the corresponding Explorer’s to 1815 flash cards. Veritas Press is a publisher that offers a literature-based curricula for a classical Christian education. They promote the memorization of facts as well as studying history in a chronological order. The Self-Paced History courses were designed to follow the events of their timeline flash cards which chronologically cover historical events. These courses contain 160 lessons that would cover 32 weeks of studying history. Each lesson contains an interactive format with talking historical figures that guide you through your history studies. In the many slides contained in each lesson are maps, games, videos, and facts about important people, events, and the time period. There is also a literature list for younger students (grades 2-3) and older students (grades 4-6) to correspond to the history topics. The Explorer’s to 1815 flash cards were designed to create a timeline of history beginning in ancient history and progressing through modern day events. The program covers one flashcard per week with 4 lessons about the information on that card as well as ample review of the previous cards, people, and events. The last lesson for each week is a test that includes multiple choice questions about the lesson for that week along with review questions from previous weeks. 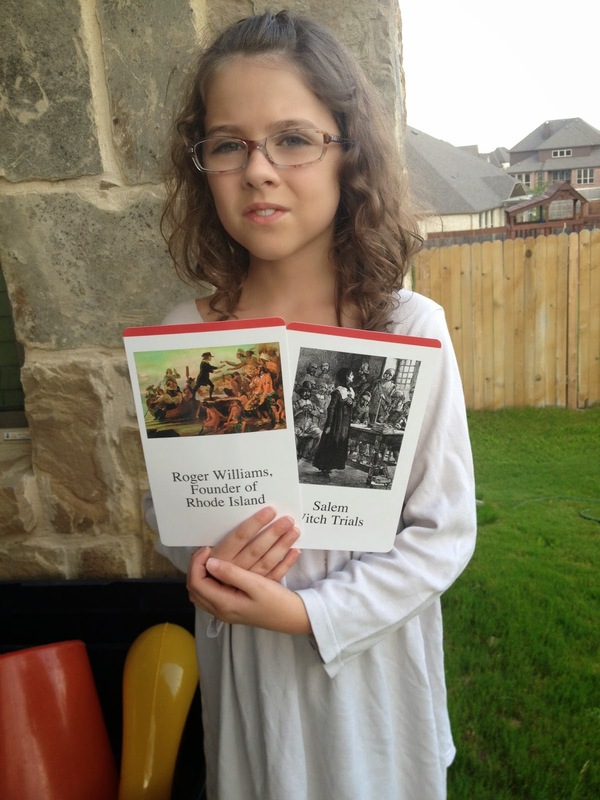 This self-paced history program is geared for kids in 2nd-6th grades. My original plan was to use this program with Curly (2nd grade). But I found that every time she watched a lesson, all the other kids wanted to watch with her. And I had to admit that I wanted to watch too! I also purchased a few of the recommended books to correspond to the lessons and let Curly read through them on her own. At the end of some lessons are reading assignments from this book list. I had planned to work through the program at the rate of one flash card per week, which would equal 5 lessons each week. The program is self-paced which allows the student to work through at any speed. I quickly had to change our plans and was so glad that this program allows for us to set the pace. My kids often wanted to do more than 1 lesson per day. We were sometimes covering two flash cards per weeks because my kids could not get enough of the lessons. Soon, I devised a new strategy. We would watch our lessons during lunch as we all sat around the table. So I had all my kids ages 8, 6, 5, 3, and 1 sitting around the laptop as we munched our lunch and learned about Columbus, the Pilgrims, and the colonies. There is even a talking totem pole who was a favorite with my 5 and 3-year-olds. It was an amazing time of learning together. My kids were even begging to watch a lesson at every meal. Can you say “obsessed?” They were thrilled! Curly sat with her pack of flashcards and a bright pink notebook filled with blank paper. As we worked through each lesson, she diligently took notes, writing down important names, dates, and facts. She read through the history card at the end of each lesson. Then she placed everything back in her notebook. By the end of the week she had 4 pages of notes about the topic for that week. She was ready to take her test after a short review period of her flash cards and her note pages. Curly was the one to complete all the assignments, tests, mapwork, review questions, and games while the rest of the kids looked on. While my other kids (grades K and below) would not have been able to complete many of the maps or answer all of the questions, I was still amazed at how much information they learned and remembered from watching Curly progress through the lessons. And I do have to mention the history song. There is a timeline song that contains the information on the front of each flash card set to music. My kids adored this silly little song. All of them can now sing the entire song and they sing it at every possible opportunity. They were thrilled to sing it for Daddy and for their grandparents. They were quite proud of themselves that they know have familiarity with these history topics, people, and events. It was their favorite part of the program. Each lesson had 20-30 slides or so and took us about 30-45 minutes to work through. This was the perfect amount of time for us. It was long enough that I felt they were thorough but not too long where their attention was lost. As you progressed through the lesson, Curly would have to click on the “next” button to move to the next slide. Each slide contained something different – facts, questions, videos, interactive games, maps, and historical figures who acted as narrators. We loved the variety in the slides and the interactive element of completing each slide and then moving to the next one. Curly enjoyed seeing her progress as she worked through the lessons. There is an amazing amount of review in this program. I was so pleased with the number of review questions or games that had Curly recall previous facts. I found that all of my kids were remembering events and facts from the earliest flash cards. Because the review is accomplished in a variety of ways, such as through games, review questions, or reading through the timeline cards online, the review was something that my kids looked forward to in each lesson. You can also print the completed review worksheets and tests. I placed these in Curly’s notebook and she used them for review. The lessons go very indepth on every topic. After seeing the history cards which contain a picture and the title on the front and some facts and extra reading on the back, I wasn’t sure how indepth the history program would be. I was thrilled at the amount of information covered in each lesson. The online lessons went far beyond the information on the card and provided details and historical facts to thoroughly cover each topic. There were even times when excerpts were read from historical documents such as logs of Columbus or written journals from the Pilgrims. Difficult topics are covered but in a way that is appropriate for the age level. There was sickness, disease, war, and other difficult topics that were covered. I appreciated that the program did not shy away from the truth in these historical events. Rather, these events were covered with enough detail for the student to understand, but the amount of information was still appropriate for an elementary-aged student. I appreciated that the program gave a balanced view of controversial topics such as the explorers’ treatment of the native peoples. The totem pole narrator gives the negative aspects of the historical events while the pilgrim narrators share the more positive aspects. I enjoyed that both sides of the story were presented and it led to further discussion with my kids. I can’t tell you how much I learned through this program. It was like having our own personal history teacher. We pulled out the cards – all of which I had a basic familiarity with the events. Then we dove into the lessons, watched footage of the locations, heard indepth facts, read excerpts from historical documents, learned about culture, and examined the events from a Biblical perspective. I loved that the work of putting together all the details of each event was done for me. The maps were very detailed and contained more places than I had learned myself. It was a great geography lesson. I was impressed with the map labeling activities and how well Curly could remember the locations. However, I did wish that we could print the maps to keep a record. While I really enjoyed the online course I did wish there were a few more printable components to keep in my records and to have in our notebooks. I like having hard copies to look through sometimes! I remedied this problem by having Curly take notes during each lesson so she has a complete notebook of extra facts, vocabulary words, people, dates, and places. Love, absolutely love, this program. My kids have never been more excited to learn history and I was thrilled that we could all learn together. I even learned more than I ever thought possible as I listened in on each lesson. There is so much depth to each lesson. The lessons are engaging and interactive and provide an amazing amount of review so that my kids were retaining names, dates, map locations, and important events and facts. I was so pleased with their retention and the love for history that this program kindled in them. I never thought I would enjoy, much less recommend, an online learning program but I heartily recommend this program. My kids have already asked me if they can do a new time period every single summer. They want to do history all summer! Unbelievable! The program can be purchased for $199 which allows you a full year of access to all the lessons. It really is amazing. I truly loved this product and I think we will have to go through each time period. And yes, I think we will do ours in the summer. It's so much fun to sit back and watch the slides when it's so hot outside. I highly recommend it! We reviewed the Middle Ages. My kids loved it and couldn't get enough of it! My daughter even did school on Saturdays! We are looking forward to using it for our main history curriculum for the fall when we resume a full schedule. Great to see a review of another time period. Great review! This was a big hit with my son, too. We used it on the weekends too! My kids beg to watch the videos. We've had so much fun with it. I'm going to have to save up to use it every year.